SoundCheck is a powerful and flexible system for testing all types of telephone, including smartphones, cellphones, VoIP phones, Skype phones, PCs used as phones, analog and digital phones. SoundCheck’s open interface means that your type of device, whether analog, digital, USB, cell or VoIP, can be connected to the SoundCheck system. SoundCheck supports third-party interface accessories that may be required for some types of phones. Soundcheck accommodates virtually all telephone test stimuli, ranging from simple stimuli such as sine waves and noise to artificial, synthesized and real speech. SoundCheck can also accommodate composite source signals (e.g. consisting of a conditioning signal to trigger the voice activity detector, a measurement signal and a modulation segment). SoundCheck can meet current and likely future telephone test standards. SoundCheck’s simple point and click test development interface makes it easy to build complex telephone tests, and a variety of pre-programmed analyses enable you to be up and running with industry standard tests fast. Whether you are testing to a telephone industry standard using a pre-programmed test sequence, building a test from scratch, or developing your own custom telephone test by modifying standard SoundCheck test sequences, test development is powerful, flexible and fast. SoundCheck can accommodate all known standard loudness rating tests. Narrowband loudness rating curves are included, and as it allows custom curves to be imported, it is flexible enough to accommodate any new loudness rating standards that may be developed. Measurement of active speech level (ASL) is also available. Testing telephone receivers, speakers and microphones is essentially the same as testing loudspeakers and microphones. The main difference is in the specifications to which they are tested and the limits that are set. In addition, SoundCheck can also be used to test other smartphone components and accessories such as Bluetooth headsets, MP3 players, docking stations and headphones. Please refer to our other application notes for information on testing these smartphone components. 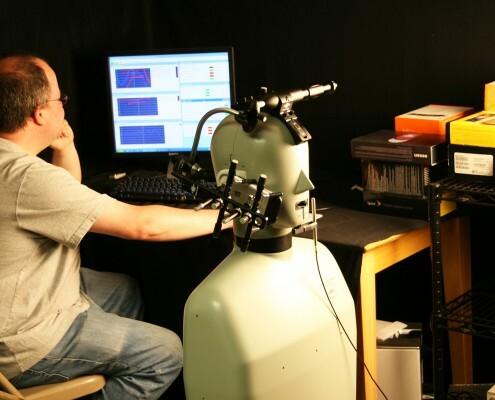 We offer test sequences written by a leading telecom test expert for testing to TIA470-C, TIA 820, TIA 920 and IEEE 1329 test standards. All major clauses of the standard are included in each package. Calibration, user prompts and the ability for the user to use the sequence as it stands or customize it make it simple to use and versatile for all telephone testing needs. SoundCheck can be set up to test telephones in a noisy environment to simulate real life situations. In this configuration, SoundCheck controls a virtual environment in which multiple sound sources are simultaneously equalized and calibrated to simulate background noise. Between the different types of phones and the characteristics we can test, there are many possible test set-ups. 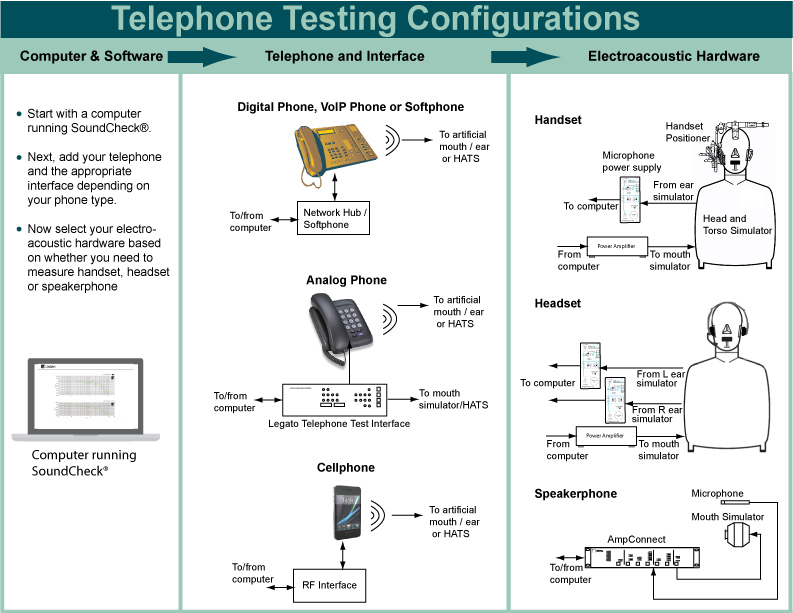 This diagram offers an overview that includes most types of phone and acoustic test. Please talk to a sales engineer about your exact requirements. Examples: How do our Customers use SoundCheck for Measuring Telephones? More information? See the right sidebar to view detailed information about the products that we recommend for telephone testing, relevant test sequences, white papers, webinars and more.